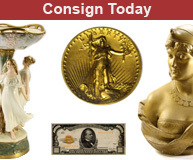 On occasion Proxiblog comes across a house that understands the coin consignment business from the auctioneer, consignor and numismatist perspectives. Such is the case with John Leonard of Leonard’s Auctions. The majority of Proxibid auctioneers are still charging a 15% consignor fee on the hammer price, on par with Heritage and Teletrade without the advertising and clientele. These houses are gradually losing business because sooner rather than later coin consignors will place their top items with the likes of Leonard. Couple 15% consignor fees with 18-20% buyer’s fees and you have a recipe for eroding your online auction reputation. Consignment terms are simple. You download an agreement by clicking here. You mail your coins to: Leonard Auction, 1765 Cortland Ct., Ste. D, Addison, IL 60101. Leonard Auction will sell your items and mail a check seven business days after the auction. Most important, from a numismatic perspective, are clauses in the Leonard contract that protect coin buyers. Proxibid has a resolution policy for counterfeit or altered coins, but it is not very transparent. Moreover, several auctioneers believe that all sales are final. They are decidedly NOT if illegal coin transactions occur–violating counterfeiting laws or the U.S. Hobby Protection Act–especially over state lines via Proxibid’s servers (a lawsuit waiting to happen). REPRESENTATION OF GENUINENESS. Consignor represents and warrants each item to be genuine. Consignor agrees that any item found to be non-genuine withint 30 days of the auction date, will be returned to the Consignor, and upon return, Consignor will pay Leonard Auction, Inc., the net proceeds of the returned item. Although Leonard Auction charges a 20% buyer’s fee, still too high according to Proxiblog’s 15% maximum standard, John Leonard is leading the way in making Proxibid a safe place to bid without unnecessary and time-consuming issues when problems arise. This entry was posted in Best Practices, Featured Updates and tagged Auctioneers, Best Practices, Coin Auction, Leonard Auction, National Auctioneer Association, Proxiblog. Bookmark the permalink. ← Do Proxiblog’s Criteria Make Cents?